The identity of Thomas S Melhuish has not been established with certainty. Although his connection with Yeovil is unknown, since his name is on the War Memorial in the Borough, what scant information we have is included in this page. Thomas S Melhuish is recorded as being born in Langport although the date has not been established. He enlisted at Southampton, joining the 2nd Battalion, Hampshire Regiment, probably in the spring of 1915. His Service Number was 3/4562. The 2nd Battalion, Hampshire Regiment were in Mhow, India when war broke out in August 1914. As soon as a territorial unit arrived to take over the garrison, they departed for England, landing at Plymouth on the 22nd of December 1914. They moved to Romsey and then on to Stratford-upon-Avon on the 13th of February to join 88th Brigade, 29th Division. They moved to Warwick and were training for France when orders arrived to prepare to depart for Gallipoli. They embarked from Avonmouth on the 29th of March 1915 sailing via Malta to Alexandria then on to Mudros in April. They landed at Cape Helles, Gallipoli on the 25 April 1915 and were involved in heavy fighting. Since Thomas is known to have died at sea on 13 August 1915, it is most likely that he was sailing to Gallipoli with other recruits, to join his regiment, aboard HMT Royal Edward when it was torpedoed. RMS (later HMT) Royal Edward was a passenger ship belonging to the Canadian Northern Steamship Company that was launched in 1907 as RMS Cairo for a British mail service to Egypt. Royal Edward was used to bring Canadian troops to Europe before being used as an internment ship anchored of Southend-On-Sea. On 28 July 1915, Royal Edward embarked 1,367 officers and men at Avonmouth. The majority were reinforcements for the British 29th Infantry Division, with members of the Royal Army Medical Corps. All were destined for Gallipoli. Royal Edward was reported off the Lizard on the evening of the 28th, and had arrived at Alexandria on 10 August, a day after sister ship Royal George had sailed from Devonport. Royal Edward sailed for Moudros on the island of Lemnos, a staging point for the Dardanelles. On the morning of 13 August, Royal Edward passed the British hospital ship Soudan, heading in the opposite direction. Oberleutnant zur See Heino von Heimburg in the German submarine UB-14 was off the island of Kandeloussa and saw both ships. He allowed Soudan to pass unmolested, and focused his attention on the unescorted Royal Edward some 6 nautical miles (11 km) off Kandelioussa. He launched one of UB-14's two torpedoes from about a mile (2 km) away and hit Royal Edward in the stern. She sank by the stern within six minutes. Royal Edward was able to get off an SOS before losing power, and Soudan arrived on the scene at 10:00 after making a 180° turn and rescued 440 men in six hours. Two French destroyers and some trawlers rescued another 221. According to authors James Wise and Scott Baron, Royal Edward's death toll was 935 and was high because Royal Edward had just completed a boat drill and the majority of the men were below decks re-stowing their equipment. Other sources report different numbers of casualties, from 132 to 1,865. An admiralty casualty list, published in The Times in September 1915, named 13 officers and 851 troops as missing believed drowned, a total of 864 lost. It is assumed that Thomas Melhuish was among them. 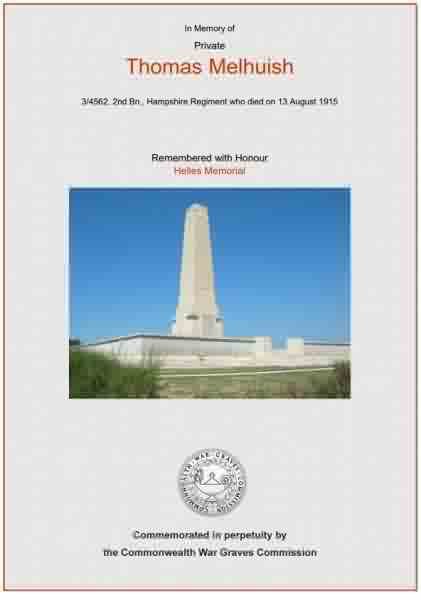 Thomas Melhuish is remembered on the Helles Memorial, Gallipoli, Turkey, and his name is inscribed on the War Memorial in the Borough. The Commonwealth War Graves Commission certificate in memory of Thomas Melhuish.